P&M Multi-Tap Delay brings a new twist to delay plug-ins. 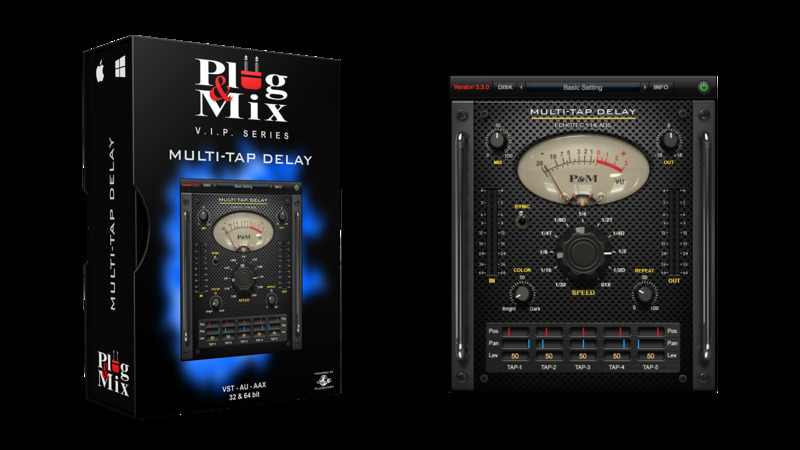 Set your general rate with the big speed knob and then prepare yourself for Multi-tap madness as you can adjust the precise position and pan of all 5 delay taps. The results can vary widely: from cascading delay lines to resonant robotic tones, to dreamy echo drones, this plug-in can do it all. P&M Multi-tap sounds amazing on guitar, vocals, synths and anything else you feed it. - SPEED - Controls the timing of the initial echo. - SYNC - Allows you to sync the delay with your master tempo. - COLOR - Dials in the brightness or darkness of the echo. - REPEAT - Turns up the feedback of the effect. - POS - Sets the position of the playhead for each individual delay tap. - PAN - Sets the pan of each of the 5 delay taps. - LEV - Sets the level for each delay tap.